Shoreline restoration: Here at CJ’s Landscaping Company, LLC, we know that shoreline erosion isn’t only a problem during the summer. That’s why we offer shoreline restoration in Brainerd, MN all year round, during rain, shine or snow. Give us a call today for more information.Snow removal: We get it—you’ve got better things to do than shoveling snow. However, here in Minnesota, snow removal is often a necessity just for getting out of your house. But don’t worry—you can call CJ’s Landscaping Company, LLC anytime for quick, affordable and immediate snow removal. We use the best heavy-duty equipment for fast and effective results, and we can provide emergency or scheduled service. Here at CJ’s Landscaping Company, LLC, we know that shoreline erosion isn’t only a problem during the summer. 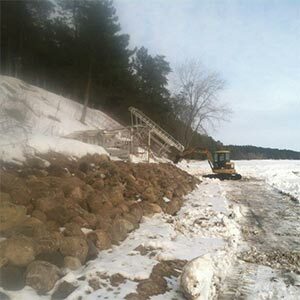 That’s why we offer shoreline restoration in Brainerd, MN all year round, during rain, shine or snow. Give us a call today for more information. We get it—you’ve got better things to do than shoveling snow. However, here in Minnesota, snow removal is often a necessity just for getting out of your house. But don’t worry—you can call CJ’s Landscaping Company, LLC anytime for quick, affordable and immediate snow removal. We use the best heavy-duty equipment for fast and effective results, and we can provide emergency or scheduled service. 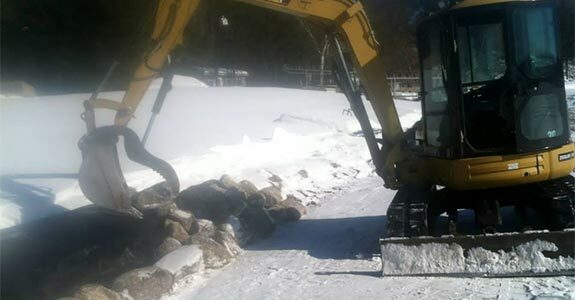 We also perform light excavation in Brainerd, MN. Whatever you need excavated, our experienced team will perform the task thoroughly and expertly so that you can move ahead with your project. During the winter months, we know that snow and heavy storms can cause serious danger to your shoreline. That’s why CJ’s Landscaping Company, LLC provides installation and maintenance of rip rap in Brainerd, MN. Keep your landscape and shoreline safe with this durable, affordable service.